Melt the butter in the microwave on short bursts on in a small pan over a medium heat – Blitz the biscuits in a food processor to a small crumb, add the melted butter, and pulse a few times until it is combined well. Melt the Kinder Chocolate in the microwave in short bursts until fully melted – leave to cool slightly whilst doing the rest. With an electric mixer (I used my KitchenAid) Whisk the Cream Cheese, Icing sugar and Vanilla until combined. Pour in the melted Kinder Chocolate and whisk again till smooth. Pour in the liquid double cream and continue to whip the mixture until it is starting to thicken a lot like a Mousse does (I use speed 6/10 on my KitchenAid)! It will hold it self completely when finished whipping – It won’t take too long as the chocolate will harden quickly and cause it to thicken. Chop up the Kinder Bueno Bars and fold through the mixture – Pour the mix on to the biscuit base, smooth over, cover, and chill in the fridge for at least 5-6 hours hours or preferably overnight. 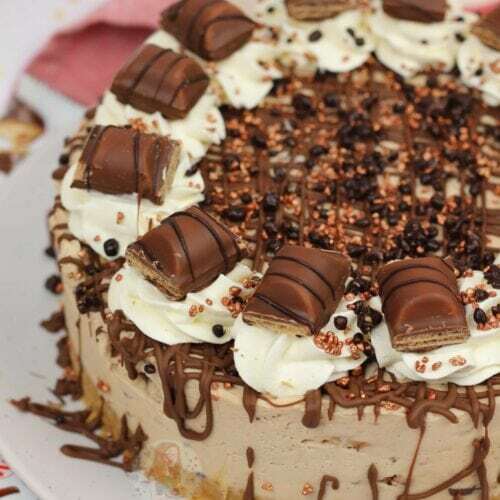 Remove the cheesecake from the tin, and decorate by drizzling over some melted chocolate, some whipped up cream (double cream + icing sugar), a piece of Kinder Bueno for each slice, and some chocolate sprinkles! ** I used 2 x 4 pack of Kinder Buenos for this. Each 4Pack contains 8 individual bars, as there is 2 in each. I used 3 for the topping, and the other 13 for the inside of the cheesecake! I used these Kinder Chocolate Bars for reference, for the filling of the cheesecake!